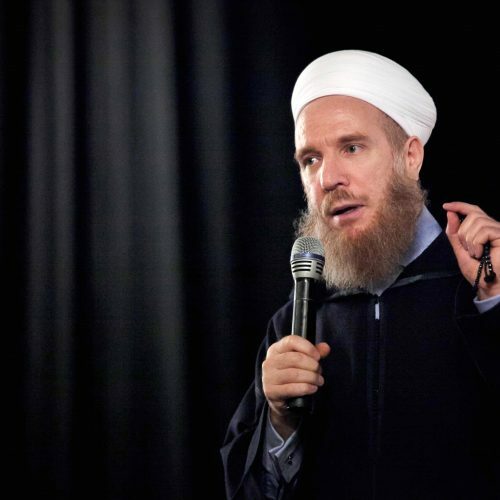 Shaykh Muhammad Al-Yaqoubi is a traditionally trained Syrian scholar, hailing from a long line of scholars. Shaykh Muhammad’s principal teacher was his father, the great scholar, Shaykh Ibrahim Al-Yaqoubi under whom he studied for 20 years. Shaykh Muhammad has ijaza (licence to transmit sacred knowledge) from some of the most notable masters of the age. His influence was most recently noted by “The Muslim 500” who ranked him as the 47th most influential Muslim in the world. Shaykh Muhammad has authored many works both in Arabic and English. The widely acclaimed work “Refuting ISIS: A Rebuttal Of Its Religious And Ideological Foundations” firmly placed Shaykh Muhammad at the forefront of global Islamic dialogue. Shaykh Muhammad traces his lineage to the Prophet Muhammad through his grandson Al-Hasan. How many times are we told to mind our own business? The Prophet ﷺ said: “Indeed among the excellence of a person's Islam is that he leaves alone that which does not concern him.” What if our intervention is necessary to assist others? The Prophet ﷺ also stated: “He who amongst you who sees something abominable should modify it with the help of his hand; and if he has not the strength enough to do it, he should do it with his tongue, and if he has not the strength to do it, he should abhor it from his heart and that is the least of faith.” How do we distinguish between matters to intervene or to mind our own? How do we respond to all the information that we are exposed to on social media platforms? Join us to learn when to mind your own business in the light of Prophetic traditions. Have you ever wondered if your business dealings are blessed? Islam is a religion built on religious and ethical standards in all aspects of life which we must adhere to in order to achieve success. Allah Ta'ala says in the Holy Quran: "But seek, with that (wealth) which Allah has bestowed on you, the home of the Hereafter." (Al-Qasas 33:21) How can we increase our sustenance according to the teachings of Islam mentioned in the Holy Quran and in the Sunnah of the Prophet ﷺ? Wealth can be both a blessing and a trial. Find out how you too can be successful in business and wealth by adhering to the correct guidelines of business in Islam as prescribed by Allah Ta'ala. The ability to recognise your own emotions and that of others and deal with situations appropriately is having emotional intelligence. This can help with anger management. Although anger is a natural human emotion, uncontrolled anger serves as a tool for shaytan leading to devastating consequences. Learning to manage anger in the light of Quran and Sunnah can have many positive effects in our lives: help with our relationships, general well-being and earn the pleasure of Allah Ta’ala. Anger can be very destructive. The Prophet ﷺ said: “Verily anger corrupts a matter just as vinegar spoils honey.” Join us and discover ways to gain emotional intelligence, manage your anger, express your feelings in a way that is more beneficial to you and others and consequently become a better human being. “Beware of envy because envy consumes good deeds just as fire consumes firewood.” Hadith. Many of us fall prey to envy leading to false perceptions of others leading happier lives. Are we agitated when we see others enjoying the blessings of Allah? Envy can be harmful to us as well as others around us. Are there situations where is envy is allowed? What is the difference between malicious envy and benign envy? Discover this and much more including how to treat envy, protect yourself and others from this disease. Patience and gratitude are important spiritual states. If incorporated into our daily life, they can elevate us and improve our life. The quality of the sincerely patient differentiates those who truly love Allah Ta’ala with those who make claims of love. In the Holy Qur’an Allah Ta’ala speaks of Sayyiduna Ayyub (AS): “......truly We found him full of patience and constancy. How excellent in Our service. Ever did he turn (to Us.)" (Surah as-saad 38:44) We must be patient and grateful of Allah Ta’ala’s favours upon us and if we thank Him, know that He "will surely increase" us. (Surah Al- Ibrahim 14:7) We are faced with many hardships and difficulties in our life, but how do we keep patient and show gratitude to our Lord? How do we continue to keep trying when we see no hope? Come along and learn practical ways to cope with difficulties and hardships and thus preserve your iman. Education is a right of all children and it is the responsibility of parents to fulfil this right. The Prophet ﷺ said: “Each of you is a shepherd and each of you is responsible for those under your care.” Join us as we explore the correct methods and etiquette prescribed by Islam in educating our children and how to strike a balance between secular versus Islamic education to produce and nurture the great men and women of tomorrow.